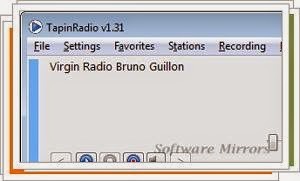 TapinRadio is a lightweight and free Internet radio software for you who want a simple and functional radio player. Its library has thousands of radio stations worldwide, sorted by region, gender and network. TapinRadio also able to record them in various formats. The stations included in TapinRadio are in the Presets menu but is much more comfortable opening them through the instant search box on the lower left corner. The table shows TapinRadio plus name, gender and country. TapinRadio Record button converts data audio stream files to MP3, OGG, WMA or AAC format, renamed as the issuing and recording date. The playback controls and volume are basic. TapinRadio also features volume control, sleep timer and automatic cuts of songs (although not able to detect breaks). For convenience, the program minimizes to the system tray. TapinRadio is a player and recorder streaming via highly recommended.